How Many Vintage Tiki Bars Are Still Around? A couple days ago, Heydays Vintage TV reached out to my friend Jeff Kunkle, of Vintage Roadside, to ask an interesting question: how many of the old, vintage tiki bars are still operating in the U.S.? Well, now, like our earlier question about which still-operating tiki bar is the oldest, this got my wheels turning. In Critiki, I track the dates when places open and close, but it can be hard to find good info, so my coverage is sometimes imprecise and spotty. Further, I’d been thinking about how to better present that information at a glance. This question helped me gel some ideas on that front, and my first step forward can now be seen on Critiki. Any classic locations that are still operating now have a “CLASSIC” ribbon indicator in the corner, similar to the “HISTORY” ribbons that indicate locations that have closed. What makes a place “classic”? By my estimation, anything that opened before about 1990. In practice, almost nothing opened after, say, 1978. Anything that opened in the ’80s was overseas, and were the final echoes of the original Polynesian Pop craze, and I believe belong in that Classic era category. 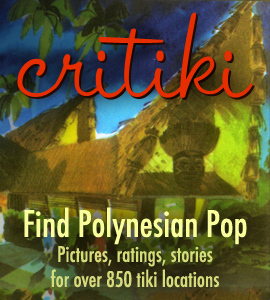 Check out the Critiki Map for tiki in San Diego: it’s a hotbed of classic tiki! Bali Hai, Humphrey’s Half Moon Inn, Trader Mort’s, the former Hanalei Hotel, The Islands Restaurant… not all of it has survived equally well over the decades, but there’s a lot of history to soak up in San Diego. In my mind, the newer places fall into two distinct eras: the early tiki revival, and modern-day tiki bars. Examples of early tiki revival bars would be Bamboo Hut in San Francisco, Otto’s Shrunken Head in New York City, and Purple Orchid Exotic Tiki Lounge in El Segundo. They may not get much attention today, now that we’re up to our eyeballs in modern tiki bars—but in the 1990s, these places were true oddballs, and kept the torches lit during what otherwise would have been a very dark time. They’ll always have a piece of my heart for that, and I’d like to help put them in context so people can appreciate the role they’ve played. I have a bit of thinking to do about how I’ll choose to present the Classic/Early Revival/Modern era distinctions on Critiki. In the meantime, I hope the CLASSIC ribbons help you spot the longstanding treasures! Oh! The answer to the original question? 74. I happened into Otto’s Shrunken Head, sometime in the mid 2000’s, perhaps it was past its prime, but it was not a ‘Tiki Bar’. They had some Tiki stuff in the front window, but inside it was a dingy, smoky, dive bar, with old vinyl furniture and no decor. In the back room, there was a band playing Grunge music at twice the volume that would permanently damage your hearing. I don’t think they had any tropical drinks on their menu. I had a beer and left shortly thereafter. I have to say, I’ve come a bit too late, being born in 74… but better late then never. I got bit by the tiki bug in the 90’s and seriously in 2007 to now. After seeing your tribute to the oddballs in the 90’s, I also wonder what people think about the newer more modern tiki bars, and artists that may be taking tiki to a different level. Some just do not capture the past of it, but might be evolving into the new future of Tiki. Is it welcome by all? VenTiki of Ventura, Ca I’ve been to and it really is a good place, and does the Mai Tai the right way that’s for sure. I have nothing to do with them, but wanted to note they do the original Trader Vic recipe and all. What if new artists come in and change the old tiki to the new tiki and make it all very different for the future, is this something people frown upon much? Thanks..